My take on John Terry! With the British Press and the media going to town on John Terry in relation to the revelations about going's on in his private life (I am not going to say on here as you all know them already) and making the front page or most of the Daily Newspapers. I wanted to give my opinion on it from my own perspective being a Chelsea Fan. Now you may or may not agree with me but we ALL have an opinion and this is mine!. I for one do not care what the hell JT gets upto in his private life!. Whatever he does is his business. I am not saying its right or wrong at all. All I care about is that when it comes to kick off on match day whether its during the week in the evening or at the weekend, that JT is 100% focused on Chelsea, focused on leading our side on the pitch in the right way and giving everything for those three points! Saturday nights game against Burnley was a great example. He stepped up after being booed for most of the game and put a header away to nick the three points for us and did a professional job for us. As long as he continues to do this for us week in week out we all couldn't care less what happens off the pitch. Let's be honest is not as if he hasn't had to deal with media reports and speculation about his personal life and family before is it?. Each time he has taken to the pitch with his head in the right place and has played well. How many times have any of you seen JT have a bad / really bad game? You can count them on one hand I can assure you!. So let's get behind JT on the pitch. Let's give him our support and the team our support as I wouldn't want anyone else leading us out to face the opposition as it would never be the same. 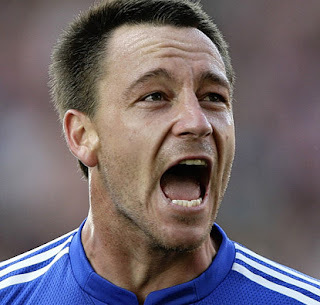 JT is Chelsea so remember its what he does on that pitch is all that matters to us!